The auditorium of the award-winning, purpose-built venue situated on a quiet mews by Cavendish Square and Oxford Street, boasts a recently installed state-of-the-art AMBX LED custom lighting system, desks with an HD laser powered LCD projector, a powerful PA system offering great sound coverage, and lecture capture facilities. Ideal for AGMs, financial results presentations and product launches, the Cavendish Conference Centre also features interactive web-streaming audio-visual facilities. The popular self-contained venue is able to facilitate MP3 and MP4 recordings, web-streaming services and video conferencing using an incredible 350MB broadband connection from summer 2019. Cavendish’s exciting webcasting service for both live events and on demand viewing uses the multi-award-winning Mediasite platform, offering event planners the capability to include remote speakers in programmers or conference calling during meetings. This will mean an outstanding growth rate of 63% over a six-year period, from £9.6m turnover in 2013/14. The centre’s growth has come from all sectors of the business, with room hire up 15.5% year-on-year, in-house caterers QEII Taste by Leiths increasing turnover by 14.5%, and QEII Live (QEII’s inhouse audio visual services) and QEII Connect (QEII’s inhouse ICT services) contributing a substantial £4.7m to the total business performance. QEII’s financial success this year follows on from an economic impact report in 2018, which found that the centre’s net economic contribution to the UK economy was £145million, and its GVA to London alone was £110.9million. After the inaugural economic impact report in 2016, QEII commissioned Grant Thornton to undertake an updated analysis last year, which reported that QEII created £312million of gross UK expenditure in 2017/18 – a growth of 61% over five years. The in-depth analysis of the QEII delegate data from 2013/14 to 2017/18 applied official data sources, industry benchmarks and multipliers, qualitative data from interviews with key partners, stakeholders and a number of clients as well as modelling to assess the impact of several key exhibitions. Alongside its economic contribution, the study incorporated data relating to employment which advised QEII supported an estimated 3,728 Full Time Equivalent (FTE) jobs – a growth of 46% since 2013/14. In 2018 the move to become a venue for creative events, as well as conferences, was recognised by the London Venue Awards which named QEII ‘Best Flexible Event Venue’. The AEO Excellence Awards also honoured QEII with the Venue of the Year <20,000sqm, and at leading experience events awards ceremony, The Drum Experience Awards, QEII won Best Large Events Venue and Best Venue Team in December 2018. The QEII hosts more than 425 national and international events a year. The seven-floor venue can accommodate up to 2,500 delegates across 32 adaptable conference and events spaces, holding up to 1,300 theatre style in a single room. Created by its catering partner Harbour & Jones, the menus offer a selection of dishes using the best of the season’s ingredients and a clear focus on British produce, including a range of English wines. There is a wonderful variety of options to choose from to truly enhance your dining experience. The general manager at 110 Rochester Row will focus on developing relationships with suppliers to further add value to the collection, which features fashionable townhouses and private members’ clubs, luxury hotels, celebrated attractions, historic institutes and societies. Andrew started his career in hospitality over 30 years ago working in both operational and sales roles and subsequently as the commercial director for venue finding and business travel agency, VRG. After a four-year stint at Compass Group setting up the central conference and events service for Lime Venue Portfolio, Andrew worked as the general manager at Charles Darwin House, home of six learned societies in the field of Bioscience. Following a very exciting contract with venuedirectory.com working on Special Projects, in May 2018 he joined the Healthcare Financial Management Association (HFMA) to manage their London meetings and events facilities at 110 Rochester Row. In addition to internal HFMA events, 110 Rochester Row welcomes external clients which include Oracle, John Lewis, NHS, local corporate businesses and various Government departments. Andrew is passionate about using technology in the hotel and venue sector and the opportunity to move small meetings to online bookings to free up time for a personal approach to more complex events. Guests entered the venue through Dean’s Yard with the stunning backdrop of an illuminated Westminster Abbey. From here they were guided to the Hoare Memorial Hall where reception drinks and canapés were served. Guests then made their way to the venue’s largest event space, the Assembly Hall, where multi-aspect intelligent lighting displays illuminated the room including the impressive domed ceiling. Once everyone was seated, the lights dimmed, and the evening got into full swing with a performance of the Greatest Showman by Club Mob. 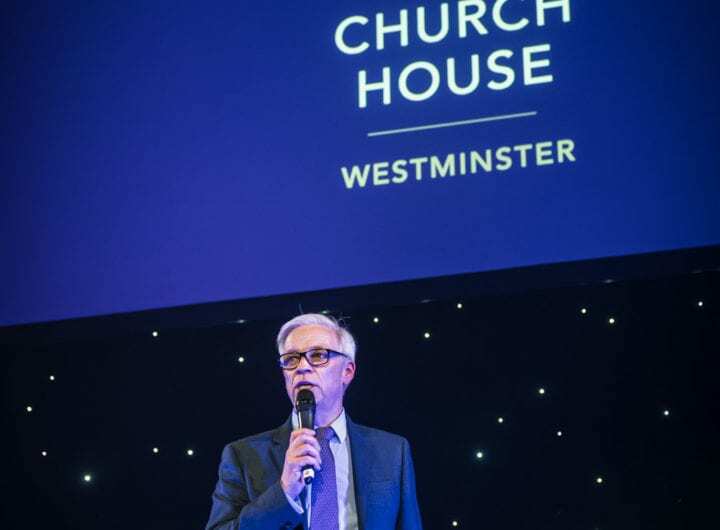 Robin Parker, General Manager of Church House Westminster, welcomed the guests and introduced the Head Chef, Joseph Lovell and Sous Chef, Davide Garzitto by means of a pre-recorded video to explain the finer details of the evening’s menu. The evening continued with songs between each course by Club Mob and by Valeria, who performed a spellbinding routine of contortion and balance on a rotating mirror ball. Commenting the following day Parker said, “Our objective for the evening was to show exactly what the venue could do and judging by the amazing comments we have received we have achieved that. For many years we have had an excellent reputation holding conferences and meetings, so it is great to be able to show clients the versatility of the venue!”. More than 150 event professionals were welcomed into the underground warrens of the evening’s three hosts – Mr Badger, Ms Rabbit and Specs – for a drinks reception like no other, with the centre’s fifth floor Cambridge room completely unrecognisable thanks to QEII’s event theming partners, EventTrees. Guests arrived through a leafy, floral walkway lit with twinkling fairy lights, emerging into the central chamber of the underground-themed space. A signature cocktail from each of the hosts was offered on arrival – Ms Rabbit’s gin, sugar snap pea, lime and mint; Mr Badger’s vodka with vanilla and chai, and Specs’ negroni-style tequila, mezcal, Aperol and rose vermouth. Exploring the hidden burrows around the room, guests discovered Mr Badger’s intimate theatre stage, Specs’ swinging jazz club and Ms Rabbit’s hipster café, before being called upstairs for the second part of the evening. Moving up to the sixth floor Mountbatten room, with its panoramic views of the London city skyline, guests emerged from the underground into a blooming daffodil, encompassing the entire room with towering petals, floor-to-ceiling projection and the sounds of bees buzzing around the flowers. Before dinner was served, chief executive of the QEII Centre, Mark Taylor, appeared in fields of daffodils projected around the room, to welcome everyone and look ahead to a year of positivity and opportunity, reflected in the theming and creativity of the evening. The starter, ‘The Vegetable Patch’, was a fresh salad of asparagus, tender stem broccoli and rainbow radish, with white bean humous and a garnish of edible flowers, accompanied by a refreshing Chablis. A main of ‘Surf & Turf’ featured a melt-in-the mouth fillet of beef with oxtail ravioli, lobster, Pommes Anna and micro vegetables, served with a Spanish Frontonio Supersonico Garnacha natural red wine, followed by ‘Sweet Dreams’ – a delicately plated dessert of almond financier, vanilla yoghurt gel, poached rhubarb, white chocolate mascarpone, custard spheres and almond crisps, with a sparking English Pinot Noir Rose. After dinner entertainment came courtesy of Ms Rabbit – in her new guise of Jessica Rabbit, performing sultry cabaret hits while working the room and charming guests. Digestif cocktails were served back downstairs in the burrows, ending an evening of spectacular transformation and creativity that cemented QEII’s position as London’s most flexible large events venue. A short trip down The Mall from Buckingham Palace, the stunning central London venue is steeped in royal history. Last year, 2018 brought London two royal weddings and this year we are looking forward to another royal baby. In keeping with the theme, let us extend to you an invitation to celebrate ‘A Royal Christmas at 116 Pall Mall’. Built on the site of King George IV’s former residence and boasting his 15ft Regency chandelier suspended above the sweeping staircase, you and your party guests will be treated like royalty, as 116 elegantly showcases its regal roots. With our flexible and fun party packages, you can enjoy banquets fit for kings or party like princesses. Whether you’re celebrating with colleagues, friends or family, make 116 Pall Mall the crowning centrepiece of your Christmas party. For more information about the 2019 packages, please email info@116pallmall.com or call 0207 451 3107. Come down, meet the team, including new Sales and Marketing Manager, Michael McGowan, and let us show you around the home of the Royal Academy of Engineering and try out our food and drink by CH&Co. To secure your place, please contact Michael McGowan by emailing Michael@princephiliphouse.com, or by calling 0207 766 0625.